Good Morning! Well I am supposed to be on my way to Philadelphia, but there is a blizzard and the airports are shut down today. I am hoping to fly out tomorrow. So today is going to be a catch up and play day. I have lots of things I have wanted to get to and today is the day to get them done. First on my list was to get this free project up. It's my new Carnival Necklace. What do you think? I am in love with it because it packs a ton of color and this time of year we all need some color. 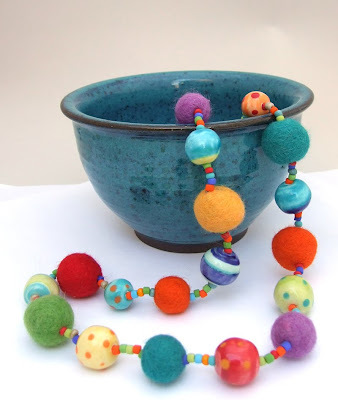 If you want to make this necklace you can scroll down to the post below this one and click on the image. It will open it in a separate window and you can print it out. Super cool, eh? I also added some sets of these fun beads to my Etsy shop. I kind of wanted to keep them for myself, but I can't make a living that way.